Insta-cure 2oz super thin, insta-cure has a water-thin viscosity that wicks deep into joints by capillary action. 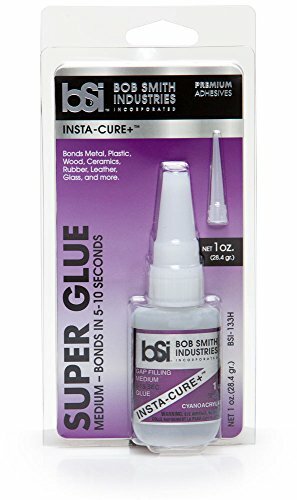 Bob Smith Industries BSI-133H Insta Cure Super Glue, 400 cps, 1 oz. Insta-Cure+ is a higher viscosity CA for loose fitting joints in which the adhesive must bridge gaps. Normally, the thicker CA is applied to one surface and then the parts are held tightly together for about 5 to 15 seconds. For large surface areas, including those with close fitting joints such as laminations, INSTA-CURE+ should also be used. To prevent premature curing, don’t spread the glue into a thin film. Lay down a serpentine bead with about 1" separations on one surface, then assemble the parts, letting the pressure spread the CA out. Directions in 5 different languages. 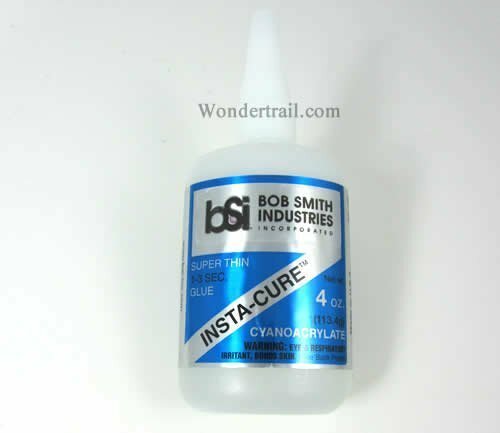 Super-gold thin odorless 1oz Bob Smith Ind. 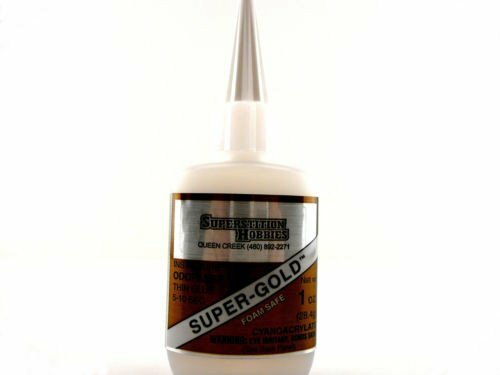 Super-Gold Odorless 1oz CA Adhesive GlueSUPER-GOLD and SUPER-GOLD+ are our odorless INSTA-CURE CAs They are non-frosting and take only 2 or 3 seconds longer to bond. There are no fumes that irritate the nose and eyes. The SUPER-GOLDs do not attack white foam; therefore, they can be used in the building of foam core wings and the assembly and repair of plastic and foam ARFs. They will not fog clear plastic. SUPER-GOLD+ is ideal for attaching clear canopies in plastic model kits; however, MAXI-CURE is still recommended for assembling the rest of plastic kits. Wood can be bonded to white foam with SUPER-GOLD + in less than fifteen seconds. For bonding foam to foam, spray a very light fog of INSTA-SET to one piece and apply SUPER-GOLD+ to the other before joining. Excess INSTA-SET may create too much heat, which can melt the foam. Both SUPER-GOLDs cure to a more flexible consistency for better shock absorbtion. Whenever a large amount of CA is to be used in such applications as saturating fiberglass or Kevlar, SUPER-GOLD eliminates the irritating fumes from the evaporating monomer that make repeated use of CA unpleasant at times. 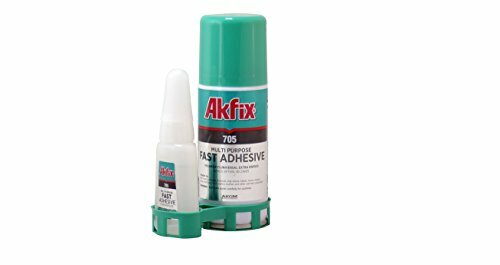 Akfix 705 Super fast adhesive with activator Kit is a high bonding strength cyanoacrylate product specifically designed to bond difficult substrates which have a porous or uneven nature. The activator helps prevent the adhesive from being absorbed into the mating surfaces. Akfix 705 is suitable for use on vertical surfaces as it will not drip or slump. Akfix 705 is suitable for bonding of a very wide range of materials, including acidic surfaces and some porous ones, where rapid bonding times are required. Suitable for MDF, wood, chip wood, rubber, most plastics, glass, leather and other common substrates. Especially suitable for the applications where cure speed needs to be Accelerated. Although Akfix 705 has a degree of gap filling ability, it is generally recommended for use on close-fitting parts and fairly smooth, even surfaces. 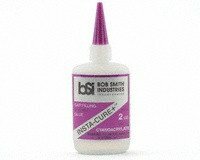 BSI322 Fine Tip CA Applicator 3ct for BSI CA Glues by Bob Smith Ind. 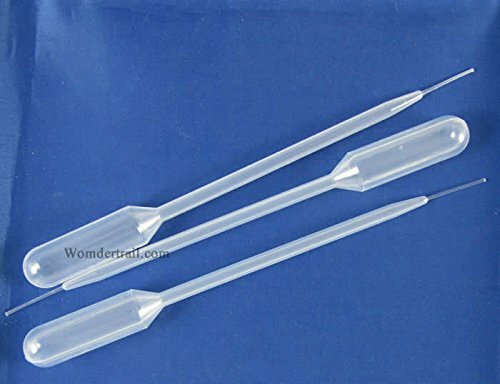 Fine Tip Non-clog 6in long pipette for the application of thin CAs. Can also be used for the fine application of Insta-Set accelerator and for applying fine lubricating oils. CA can be kept in the applicator for two weeks. 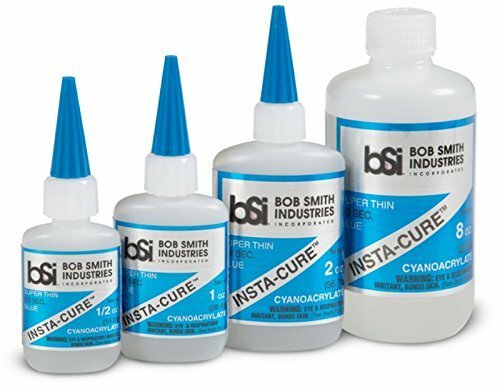 Compare prices on Bob Smith Ca Glue Thin at ShoppinGent.com – use promo codes and coupons for best offers and deals. Start smart buying with ShoppinGent.com right now and choose your golden price on every purchase.